After the initial Pz.Kpfw. IV report during 1940-1942, based on captured early models, the British didn’t have the best of opinions on the German medium tank. The Pz.Kpfw. IV didn’t have an impressive armour, armament, nor operational characteristics. However, as the war continued, the Germans still had one trump card up their sleeve, which turned a big, weak and uncomfortable tank into a dangerous enemy – a long-barreled 75 mm gun. The new Pz.Kw.IV gun is called 7.5cm Kw.K.40. It replaces the existing 7.5cm Kw.K short-barreled gun. The technical characteristics of the gun are unknown, but the gun is described as having a long barrel. In all likelihood, this weapon has a high-velocity projectile. The report also noted that similar guns were placed in self-propelled guns on the Pz.Kpfw. III chassis instead of a short-barreled 75 mm gun. But only in the December report, it was reported that a tank with a long gun had been re-designed with 50 mm frontal and 30 mm side armour – the author of the report was not familiar with the Ausf. F1 modification, which was rarely mentioned in British documents. 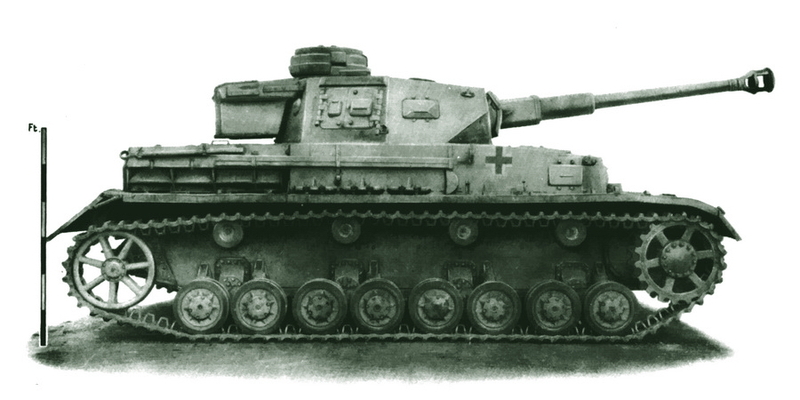 Sketch of Pz.Kpfw. IV Ausf. G. The tank differs from previous versions by the double side hatches in the turret, a 7.5 cm Kw.K 40 gun, a new hemispherical machine-gun installation, a front plate in one plate, air vents in the hatches on the gearbox, new driving wheels and slots in the tracks. By December 1942, the tank already had a new index, Pz.Kpfw IV Ausf. G, but in most documents, it was still called by the old name Pz.Kpfw. IV Special – “the special Pz.Kpfw. IV”. This designation was applied to any “four” with a long-barreled gun, regardless of modification. 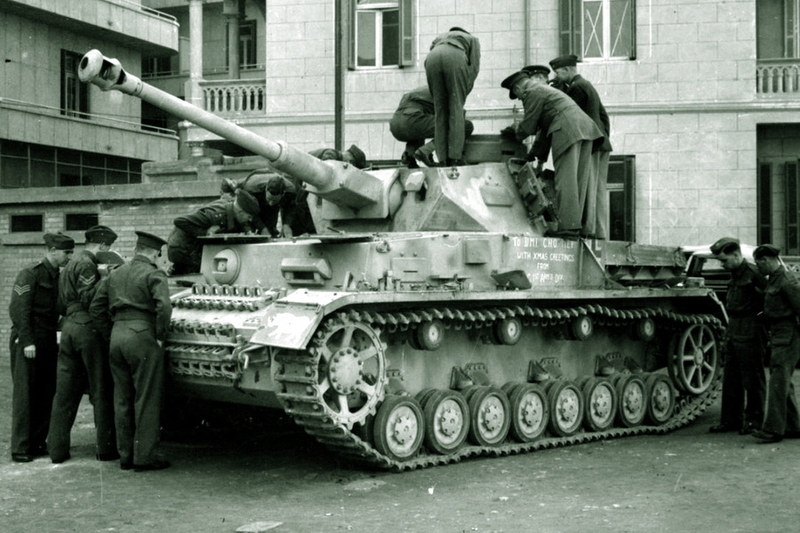 In December, British specialists were lucky: the 1st Armoured Division captured a Pz.Kpfw. IV Ausf. G and sent it back to the United Kingdom as a Christmas present. It was planned to send the trophy to be tested after a demonstration to the command but mysteriously stopped working before reaching the proving grounds of the Mechanical Warfare Experimental Establishment (MWEE) in Farnborough. British specialists wanted to at least test the new gun but this was also proven impossible due to the lack of armour-piercing shells. Just like with the Pz.Kpfw. IV Ausf. D, they had to be content with the inspection of the newly captured vehicle. The British managed to find how such a powerful gun could be fit into the turret, without increasing its size: the gun was pushed forward as far as possible and balanced with a special spring. This was hardly ideal since the turret lost its balance and if the tank was standing on a slope, it was impossible to rotate it. Even the half-weight counterweight, installed by the British, didn’t allow the turret to be easily rotated. The heavier gun obviously didn’t improve the working conditions of the crew: there was only 40 cm between the should strap and the gun barrier and 25 cm between the centre of the commander’s turret and the shoulder strap. This, of course, didn’t facilitate the commander’s job in any way. British armour scheme of the Pz.Kpfw. IV Ausf.G. British specialists also measured armour thickness and the findings turned out to be the same as those of the Pz.Kpfw. Ausf.F1: 50 mm frontal armour and 30 mm side armour. The thickness of the fighting compartment roof was 14 mm, the turret roof was 12 mm and the engine compartment was only 10 mm. Unfortunately, no further data could be gathered, as the vehicle was in poor condition. The specialists were hoped for a quick arrival of new trophies to gather further data but had to wait for quite a long time. 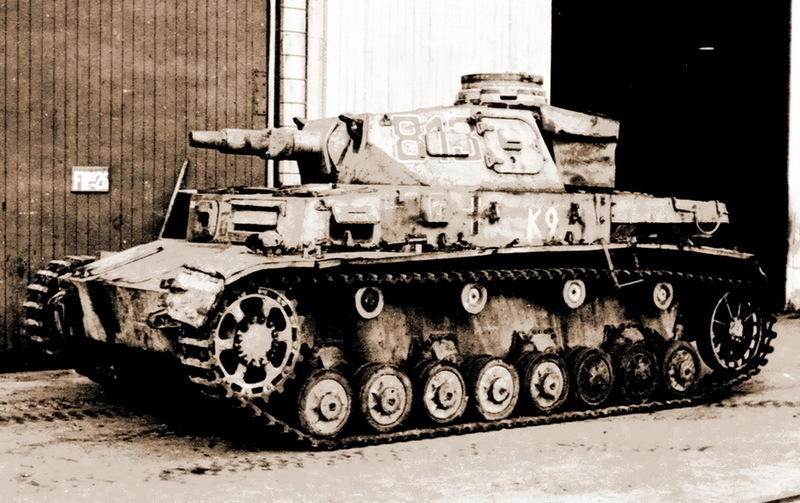 The second Pz.Kpfw. IV Ausf. G was captured and delivered only in August 1943, but this time, the vehicle was almost in perfect conditions, as only the towing hooks were damaged. The vehicle speedometer only had 482 km, it even had a marking for rail transportation indicating a weight of 22,400 kg and a red cross indicating the centre of gravity. All tools and devices were also in place, with the exception of the crew’s personal weapons and a smoke grenade launcher. The British noted that this second vehicle was better made than its predecessor, leaving the impression that the first trophy was a pre-production vehicle, while the second one looked more like a production vehicle. British soldiers and officers looking at the captured Pz.Kpfw. IV Ausf.G. Picture was taken in Cairo on December 29, 1942. The inscription “Christmas greetings to the chief of military intelligence from the 1st armoured division” is on the board. On the front, left wing is a white rhinoceros – the emblem of the British Union. 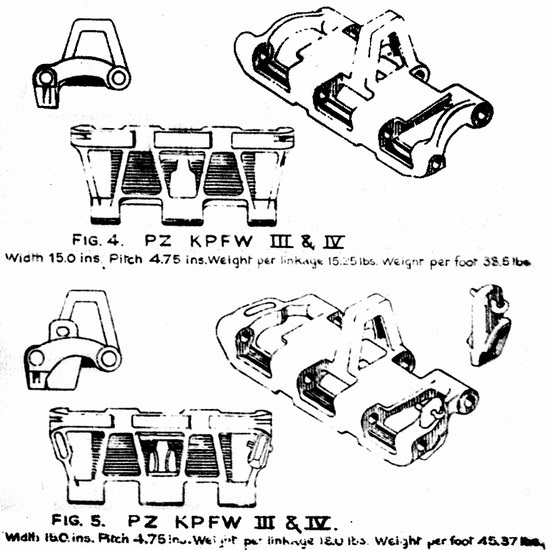 First of all, the researchers examined the gun, in contrast with the 5 cm Kw.K 39, that only had a longer barrel when compared with the 5 cm Kw.K 38, the 7.5 cm Kw.K 40 and the short 7. cm Kw.K had almost no interchangeable parts. It was noted that the design of the cradle and other mechanisms had more similarities with those used on the Pz.Kpfw. III. The movable gun shield also looked similar to the one used in the Pz.Kpfw. III. The corners of the vertical pickup were slightly narrowed, allowing the gun to be raised up to 20° and inclined by 8°. The vertical adjustment was carried out by a flywheel, which was set in motion by the gunner’s left hand, each turn of the flywheel raised or lowered the gun by 0.8°. The rotation mechanism remained about the same as in earlier versions of the Pz.Kpfw. IV. The maximum turret turn speed remained low, while it was easy to stop, it was difficult to point the gun accurately or follow a target. Accurate aiming was possible only when the turret was manually turned. The gear ratio of the manual turning mechanism was decreased, a full turn now required 190 cycles of the flywheel. There was also an innovation in the tank: an auxiliary flywheel for the loader with a different gear ratio, reducing the turret full rotation to 131, but it was impossible to turn the turret just with the auxiliary flywheel. Trophy Pz.Kpfw. IV Ausf.G. The vehicle is not fully complete: there is no “Rommel’s” storage box. As noted earlier, the long gun barrel was balanced by a spring that rested against the floor of the fighting compartment, which was reinforced for this. The spring didn’t fully cope with the task and the gun swayed quite strongly while driving the vehicle. In the opinion of the report author, this heavily loaded the vertical guidance mechanism. If the vehicle was to move, the gun had to be put on a stopper and the tank could hardly shoot on the move. The spring also didn’t help with the balance of the turret, the British didn’t measure the centre of gravity accurately, but the turret was noticeably bent forward. The gunner could fire the gun by pressing a button on the flywheel that turned the turret. The electric trigger was powered by a 12-volt tank battery, but it was also possible to power the mechanism with a portable 4.5-volt or 9-volt battery. Unlike the Pz.Kpfw. 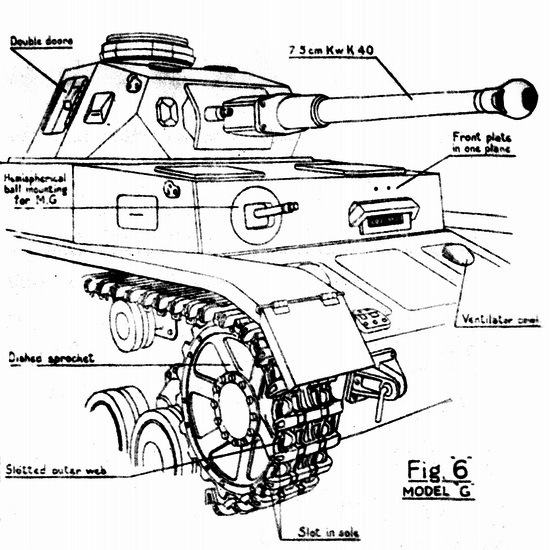 III, the driver didn’t have an indicator of the gun dimensions beyond the dimensions of the tank, which the British were expecting on a vehicle with such a long gun. On the left is the combat compartment of Pz.Kpfw.IV Ausf.G from the gunner’s side, on the right is the workplace of the gunner-radio operator. Above the headrest of the sight is visible dome-shaped support for the head. The new machine-gun installation didn’t receive much attention. In contrast to the main gun, it outweighed back and to balance a metal-stopper was used, which the shooter had to support with his head. Also, the machine-gun had a balancing spring but it pulled it to the side. The machine gun had its mount in a different way, difficult to operate, as the handle was obscured by a radio station. Ammunition was 87 rounds for the main gun and 2,250 rounds for the machine guns. British experts have come to the conclusion that the 16 nests in the ammunition rack were handcrafted, perhaps even from shell boxes. These additional boxes blocked the already difficult access of the driver to the fighting compartment, with the additional ammunition load, the tank could only be left through the hatch in the roof of the command compartment, which didn’t open when the turret was facing the back of the vehicle. The rest of the Pz.Kpfw. IV Ausf. G has changed little compared with the previously examined vehicle. It was noted that the vehicle wasn’t very different from the Pz.Kpfw. IV Ausf. F. The list of the main features of this vehicle was repeated in the report: single front plate 50 mm thick, new hatches for servicing the gear-box, hatches in both sides of the turret with double wings, new tracks. The tank armour was also at the Pz.Kpfw. IV Ausf. F1 level. Unlike previous examples studied in England, surface hardened plates were quite widely used on this vehicle. Al vertical front plates, as well as the sides of the hull and the turret, had a hardness of 460-520 Brinell units from the outside and 250-280 from the rear. The sides of the turret were tempered to a more familiar hardness, 340-360 units. There were cracks in the welds and in the armour next to them. A steel plate 30 mm thick was welded to the vehicle front, increasing its thickness to 80mm in total, as on the Pz.Kpfw. Aufs. E.
The report also noted various less noticeable changes in the electrical and cooling system. Naturally, the main attention was on the new gun. The captured vehicle had a chance to be demonstrated again, during a parade in Lulworth on March 31, 1944. The Pz.Kpfw. IV participated in a shooting demonstration in the category of “foreign and advanced tanks” alongside with a Tiger I and KV-1. In the list of tactical and technical data of these vehicles, the maximum speed was noted, which fell due to the heavier gun, to 35 km/h. Another tank was captured and send to the USA. It was unclear if it was an Ausf. F2 or Ausf. G, as the report was called PzKw IV Model GF-2. At the end of November, the vehicle was shot at the Aberdeen Proving Ground and armour samples from 12.2 to 51.8 mm thick were sent to the laboratory for chemical analysis. Like the British, American experts noted large cracks in the welds and armour plates. Repeated quenching by American methods to a hardness of 240 Brinell unites, instead of the initial 290, significantly increased the viscosity index. The quality of the joints also left much to be desired. According to the Americans, either an inattentive or inexperienced welder was involved in welding. The chemical composition of the armour served as an indicator of the economic situation in Germany: the chrome in the armour was abundant, but there was little nickel and molybdenum. According to American scientists, armour of similar quality could be made using a much smaller number of alloying additives. 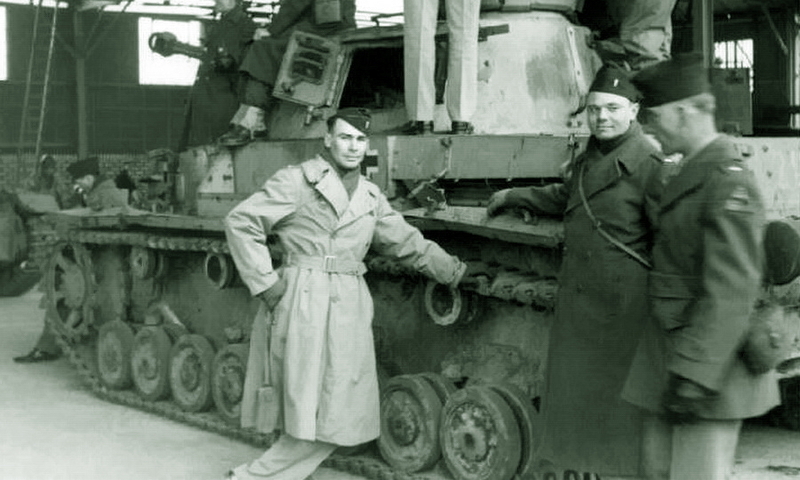 The general opinion of American experts was as follows: the quality of German armour dropped significantly compared with the previously studied samples. While the design of the vehicle didn’t differ much from earlier versions of the Pz.Kpfw. IV, the new gun aroused genuine interest. At the time, in 1942, it was the most powerful tank gun the Germans had in a tank, which the British knew about, and only by setting the characteristics of the new gun, it was possible to judge the effectiveness of armour on British tanks for the near future. The design of the T.Z.F.5f sight noticeable improved compared to the T.Z.F.5b on the Pz.Kpfw. IV Ausf. D. Monocular 2,4-fold sight now had three scales: for an armour-piercing shell (up to 2,500 meters), high-explosive fragmentation shell (up to 3,300 meters) and subcaliber (up to 1,500 meters). The machine gun was built on the high-explosive scale. An anti-reflection coating was applied to the sight, but its degree of effectiveness was not evaluated. The clinometer on the gun 7.5 cm Kw.K 40 L/43 was missing. The presence of armour-piercing shells allowed the British to test and evaluate the new German gun- The gun could penetrate up to 120 mm of vertical armour, which was enough to fight any British tank, including heavy ones. 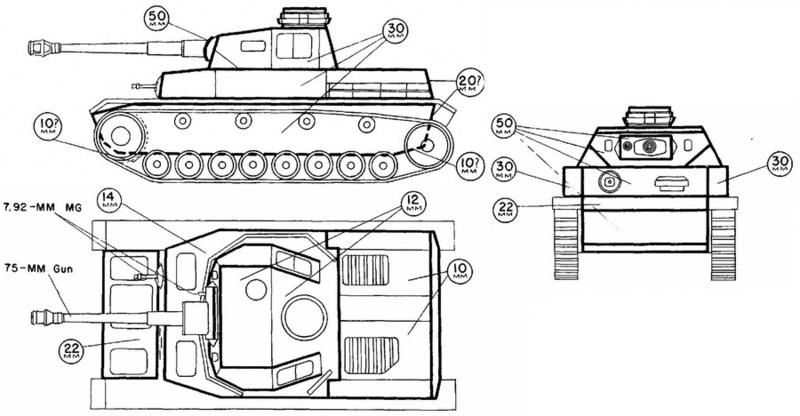 The tactical diagram for the American Sherman, created with this data, looked a little more comforting, as the Pz.Kpfw. IV Special could only penetrate the frontal armour of the Sherman at close range, although it could penetrate the gun shield frontal armour at 200 meters. The remaining parts were much more vulnerable, the vertical parts in the transmission could be penetrated at 2,200 meters, the front of the of turret could be penetrated at 1,830 meters and vertical side armour could also be penetrated from long distances. Inspection to the Shermans used while testing the gun, confirmed the calculations: tanks were mainly vulnerable on the sides and in the turret. 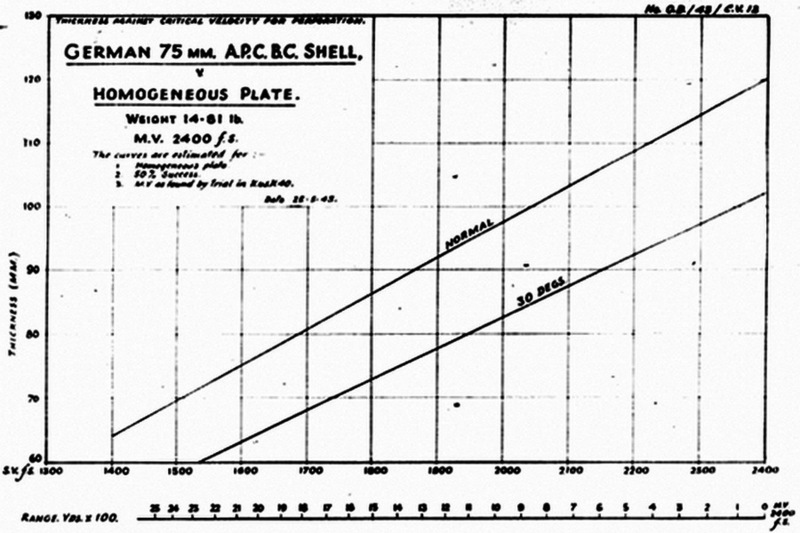 Calculated armour penetration of the 7.5 cm KwK 40 L/43 gun according to the British method (the limit of through penetration with a probability of 50%). With the new weapon Pz.Kpfw. IV became a dangerous opponent for any Allied tank. But the Sherman was far from defenceless, the American 75 mm armour piercing shells M61 could easily penetrate 50 mm of armour. The more powerful British 6-pounder anti-tank gun, 17-pounder and American 76 mm guns, were even more effective. The anti-Pz.Kpfw. IV Ausf. G manual, compiled in 1944, all lines in the table with distances of effective fire had the same phrase: “Vulnerable from a distance of over 2,000 meters”. With the new gun, the German medium tank stopped being easy prey for Allied tanks, but the Germans never achieved superiority. Awesome reading! Well done, thanks for including it on your site.